Let SERVPRO of Edmonds Help You Prepare: Create an Emergency Ready Profile! A concise Profile Document that contains only the critical information needed in the event of an emergency. – It will only take a short time to complete and will not take you away from current projects, it will save you a lot of time if ever needed. Establishes SERVPRO of Edmonds, Lynnwood & Bellevue West as your disaster mitigation and restoration provider. – You have a provider that is recognized as an industry leader and is close by. 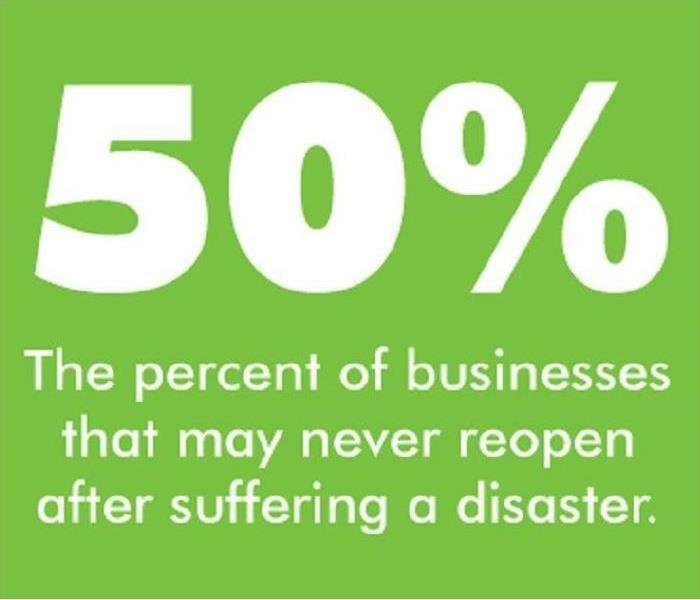 As many as 50% of businesses close down following a disaster and of the businesses that survive, the overwhelming majority of them had a preparedness plan in place. Pre-planning can serve as an insurance policy aimed at peace of mind. And knowing you are “Ready for whatever happens” communicated trust and peace of mind to your clients and employees. Frozen Pipes? Call the SERVPRO of Edmonds Team! Severe winter weather ranks third as a cause of insured catastrophic losses, after hurricanes and tornadoes, according to the Insurance Information Institute. Losses from snow, ice, and freezing temperatures across the United States average about $1.2 billion a year, according to the New York Times. Preparing your home for cold weather can help avoid potentially costly problems, like frozen pipes. When water freezes it expands. That's why a can of soda explodes if you put it into a freezer to chill quickly and forget it. When water freezes in a pipe, it expands the same way. If the water expands enough, the pipe bursts, water escapes, and major damage can begin. So what can you do to avoid frozen pipes? First, make sure your heating system is working properly and that vulnerable pipes, like those that run close to your exterior walls, are insulated. If you go away for several days in the winter, make sure you leave the heat on. The Insurance Information Institute recommends setting your thermostat at 65 degrees. Have someone check your home and property, if you can. If you expect to be away for extended periods - say, you go South for the winter - have your water turned off. Keep your garage doors closed if you have water supply lines in the garage. Open your kitchen and bathroom cabinet doors to allow warmer air to circulate around the plumbing. Keep your heat at a minimum of 55 degrees at all times. Keep it at 65 when you're out of town. During severe cold turn on both hot and cold faucets near outside walls to allow a small trickle of water to run during the night. Remove your outside hoses and store them inside during the winter. If you need to be away from home, consider draining your water system before you go. Identify the locations of shut-off valves so that you're prepared to stop the flow of water as soon as possible when a pipe bursts. Shut off water at the main valve. Your shut-off should be easily marked with a tag. Call SERVPRO of Edmonds if you would like one. Call a professional restoration expert such as SERVPRO of Edmonds to mitigate the damage. Keep an emergency number nearby for quick access! Call us anytime at 425-775-5723. No building is immune to mold growth. Any event that causes moisture to infiltrate the structure could very likely spur mold growth because the microscopic spores of mold are present throughout indoor and outdoor environments. A flood, broken pipe, roof leak, or prolonged exposure to moisture such as in a bathroom without good ventilation could create an environment where mildew and fungus can grow, reproduce, and inflict dry rot on the structure. Unless a person notices a flood or leak, moisture buildup might go unseen until an abnormal smelly odor arises. The smelly odor comes from the metabolic function of the microorganisms that give off volatile organic compounds. Deodorization alone cannot solve the problem because it would only cover up the smell of mildew and mold growth. When a smelly odor persists but mold growth cannot be seen, then mold growth behind a wall could be happening. Mold in a home could also occur inside heating and cooling ducts and vents or behind wallpaper. Visible mold like black mold represents a clear warning sign of mold in the home. Black mold can appear as blotchy and expanding dark areas on drywall, studs, or under carpet. People need to take signs of fungus and smelly odors seriously. Technicians trained in mold removal, remediation, and deodorization will have special equipment that can test the microbial nature of the fungus or mildew to determine how to treat it. They will know how to assess both commercial mold damage and mold in homes. After determining the species of fungus present, SERVPRO of Edmonds will begin the mitigation of mold damage by first fixing the moisture problem. This can be as simple as cleaning up water from a flood or obvious leak that has already been fixed. In other cases, an investigation might reveal that poor drainage outside is causing water to seep into a basement or that ventilation needs to be installed. The remediation and structural experts at SERVPRO of Edmonds will address these needs. Drying goes hand in hand with water cleanup. A mold removal contractor will have commercial-grade fans and dehumidifiers to dry up the infected areas and stop the spread of mildew and mold damage. Drying alone will not suffice to fix contaminated materials like carpet or drywall. The mitigation process will require removal and replacement, especially of wood that has experienced dry rot. Structural elements that cannot come out will be deeply cleaned and mitigation treatments will be applied to stop new problems. These efforts will achieve deodorization of the smell caused by commercial mold damage or mold in the home. Our Mold Removal Professionals have the resources to begin mitigation efforts as soon as possible unlike a property owner who has many other daily responsibilities.The rapid cessation of mold growth behind walls or commercial mold damage is important to prevent spreading. Visit http://www.SERVPROedmonds.com for more information on how to prevent and treat Microbial Growth. Storm damage can come in many forms, each devastating in its own way. Roof damage, ice damage, ice damming, frozen pipes, hail damage, wind damage, hurricane damage, flooding, and river flooding are all common effects of storm damage. Flooding can be caused by runoff ground water, overflowing storm drains, torrential rains, hurricanes, or super-cell thunderstorms. River flooding and an excess of ground water are commonly associated with hurricane damage and can be devastating. River flooding can occur anywhere that homes or businesses are in close proximity to rivers or large creeks. Torrential rain water can also cause a roof leak related issues which may require professional roof repair. Water damage is usually caused by flood water or runoff ground water that is not able to properly drain. Flood water doesn't need to remain in a structure long to cause massive amounts of damage. Unfortunately even small amounts of flood water can cause mold or mildew to begin growing in a structure. Flooding should be dealt with by a professional company and staff that is trained in proper storm remediation; such as our SERVPRO of Edmonds Professionals. The use of a proper flood pump is almost always necessary in situations where flood water and water restoration is needed. A reliable company will know exactly which type of flood pump is needed to remove any standing water. Apart from using a flood pump, industrial drying tools are also commonly needed for proper storm remediation. Immediately removing flood water with the proper type of industrial flood pump or by use of similar equipment is one of the first steps necessary in business or home restoration. Promptly choosing reputable storm restoration and roof repair companies may help home and business owners prevent further damage from seeping ground water and may even expedite the water restoration and roof repair processes. Hail damage and wind damage are common forms of storm damage that professional home restoration companies are familiar with. Roof damage and roof repair may be necessary. If hail damage occurs, a professional storm restoration company can give homeowners advice on what steps to take toward storm remediation. They will check the levels of hail damage, take a look at siding and roof damage, and may even be able to help prevent a roof leak. A roof leak after a hail storm is likely an after effect of hail damage or wind damage. Roof leak related issues can be handled easily by the professionals at SERVPRO of Edmonds. Ice damage can take place almost anywhere. Frozen pipes, Ice damming, and other forms of ice damage are very common problems many people face each winter season. Ice damming is caused by build up of ice around the edge of a roof which then can stop melting snow from draining correctly. If an ice dam has caused roof damage to your home or business, removing the ice dam and preventing future ice damming is key. Ice dam removal may require the help of professionals as well. These same professionals may be able to help with frozen pipes. 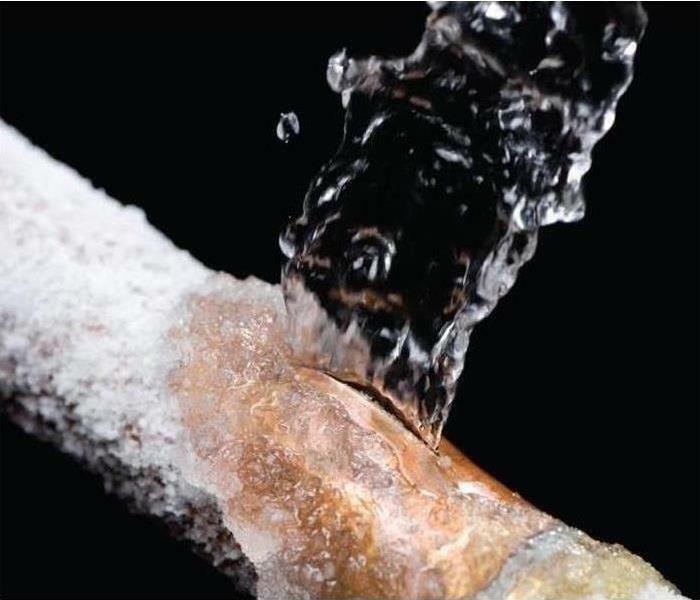 Frozen pipes can lead to substantial damage to a structure. Professional help can be crucial when dealing with winter storm restoration and damage. Visit http://www.SERVPROedmonds.com for more information on storm damage or to get help immediately. Make a list of anything you need that uses electricity; plan for batteries and other alternatives to meet your needs when the power goes out. Plan if you have medication that needs to be refrigerated. Talk to your doctor about what to do with medicine if you lose power. Keep refrigerators and freezers closed. Use a thermometer in the refrigerator and freezer so that you can know the temperature when the power is restored. Throw out food if the temperature is 40 degrees or higher. Make sure to have a flashlight and extra batteries at home so that you can see where you’re going and what you’re doing. Have enough non-perishable food and water for your family. Keep your mobile phone charged and consider investing in a back-up battery if you don’t already have one. Keep your gas tank full to make getting around easy. Consider checking on your neighbors, especially elderly or those with special needs. Do not use a gas stove to heat your home, if safe go to an alternative location to stay warm. Contact SERVPRO of Edmonds at 425-775-5723 if you would like more information on preparedness procedures for your home or business. We are available 24/7 365 days a year to serve our community! Serving a deep fried turkey on Thanksgiving has grown in popularity over the years as people experiment more in their kitchens. While it may be a mouth-watering option is the risk truly worth it? Many of you may have seen the numerous videos of turkey fryer explosions and fires publicized online. 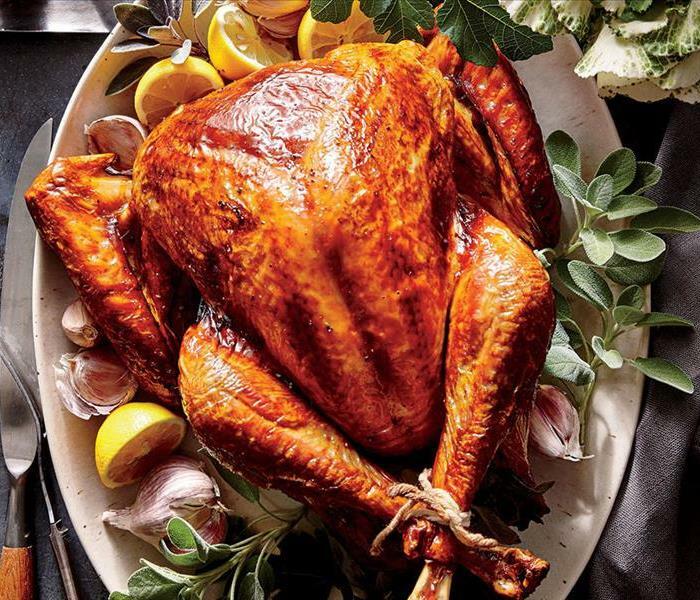 Don’t run the risk of property damage or injury – make sure you take the proper precautions when menu planning this season; especially if you are taking on a deep fried turkey. Turkey Fryers can easily tip over, spilling hot cooking oil over a large area. Consider placement of the fryer, is it flat, sturdy, out of reach from children? Without thermostat controls some turkey fryers can overheat oil to the point of starting a fire. Make sure it’s not too hot. Your friends at SERVPRO of Edmonds wish you a Happy Thanksgiving and remind you to stay safe. Remember, our team is on call 24/7 365 days a year, no matter what holiday or time of night. If you experience a fire SERVPRO of Edmonds will come to your rescue, don’t hesitate to call 425-775-5723. The Edmonds Community becomes alive in fall with the crunch of leaves and vibrant colors that come alive throughout the quaint downtown. Many Edmonds homeowners and businesses decorate their space to reflect the festivities of the season and anticipate the trick-or-treating crowds. Keep in mind some of these Halloween safety tips as you venture out for an evening of fun in Edmonds. If a sword, cane, or stick is a part of your costume, make sure it is not sharp or long. A child or even adult may be easily hurt by these accessories if he stumbles or trips. Small children should never carve pumpkins to avoid unwanted cuts. Encourage children can draw a face with markers and have parents do the slicing. Consider using a flashlight or glow stick instead of a candle to light your pumpkin- they can be fire hazards. If you do use a candle, a votive candle is safest as does not tip easily. Have a safe and happy Halloween and call us in case of an emergency at 425-775-5723. What does the Fall season mean to you? Vibrantly colored leaves, pumpkin spice lattes, early more fog and cooler weather setting in. Edmonds, Washington is simply beautiful this time of year for residents and visitors alike. The Edmonds Art Walk and Scarecrow Festival is in full swing and families are invited to trick-or-treat at downtown merchants on the Halloween Holiday. As the season changes so does the weather and SERVPRO of Edmonds would like to offer you some great advice on how to prepare your home (or business) for Fall. Clean Out Your Gutters: Throughout the summer months there a high chance your gutters filled with leaves and grime and this will get worse as fall progresses. Clogged gutters can form ice dams in the colder months that prevent your drainage systems from working properly. Then, leaks can happen within the home or business, causing a multitude of issues. Get ahead by simply clearing out your gutters as the leaves begin to collect. Light Up Your Outdoor Area: Fall and winter means less daylight, leaving a possibility for more accidents. If you don't have lights outside of your home and driveway yet, installing some is a great way to keep your home just a little safer. Lights around the perimeter of your driveway and business or home can mean fewer accidents and even act as a deterrent for break-ins. Check In On Your Heating System: Fall signals the first time in months that you will be using your heating system. Schedule an annual heating system checkup, and also manually survey your home's heating vents to make sure they aren't blocked by anything that could be a fire hazard. Dust off vents and clean filters to ensure everything is functioning properly. Lastly makes sure you have SERVPRO of Edmonds’s contact information in the event that you may have an emergency; our helpful team can be reached at 425-775-5723. If you experience a fire or water damage in your home these items, of high monetary value are among the most difficult to replace if stolen or destroyed. Be sure to save receipts and serial numbers for these 5 high-ticket items, and include them in your digital photo or video home inventory for insurance purposes. Electronics & Appliances Electronics and appliances are among the most sensitive and easily damaged items in your home in the event of mishap. They are also among the most sought-after by thieves. Jewelry & Costly Clothing Not all policies cover high-dollar jewelry. Check your coverage limit carefully for terms. And be sure to have jewelry items appraised regularly, preferably annually, to ensure an accurate representation of their current price. Collectables These items should also be appraised regularly at a reputable establishment to ensure an accurate representation of their current price and the need for additional insurance coverage as they go up in value. Firearms Homeowners and renters insurance also typically includes coverage for guns, from standard hunting rifles to collectables and antiques. How Will Your Items Be Valued? Items on your home inventory checklist will be valued in one of three ways depending on your coverage rules, so be sure to read over your policy carefully. Cash value: Replacement cost minus depreciation (think: garage sale prices). Replacement value: The amount you’d pay to replace your belongings at the time of loss (today’s retail prices). Appraised value: Typically used for one-of-a-kind antiques and valuables, which have been appraised and documented via your home inventory template. 1/29/2019 - Let SERVPRO of Edmonds Help You Prepare: Create an Emergency Ready Profile! 1/29/2019 - Frozen Pipes? Call the SERVPRO of Edmonds Team!